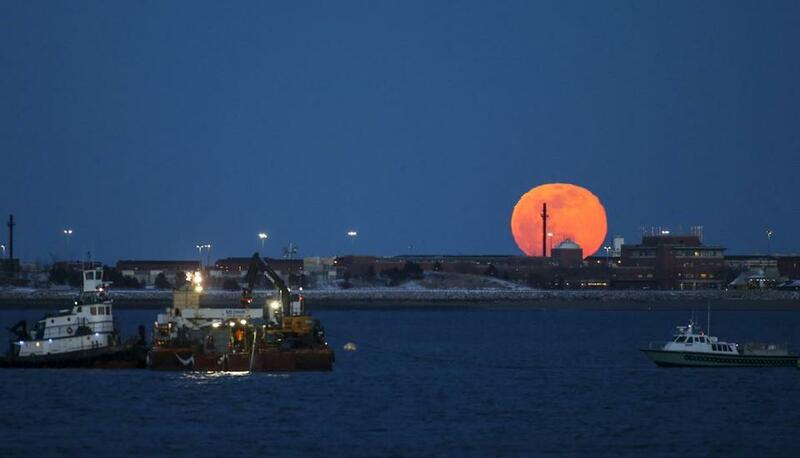 February’s full moon, a “snow moon,” rose over Boston Harbor on Tuesday evening. Look up, people: February’s full moon, normally nicknamed the “snow moon,” will also be the brightest super moon of the year, and it will be visible across New England Tuesday night. Wondering what’s going on and how to see it? We’ve got you covered below. What is the ‘super snow moon’? Full moons in February are often nicknamed the snow moon, for how much snow tends to fall in the month. However, this one is special: It’s also a super moon, and the brightest one at that. According to the NASA, full moons are considered super moons when the moon is at its closest point in its orbit to earth, or its perigee. The super snow moon is the second of a trio of super moons 2019 will see. In January, we had an eclipse during a super blood wolf moon; the third super moon will come up in March. People across New England posted photos Monday night and early Tuesday as the moon headed toward peak fullness, which it technically reached after moonset, at 10:53 a.m. Tuesday. So when darkness falls and the moon rises Tuesday, it will be a little bit on the wane. But don’t sweat — it will still be pretty impressive after it rises again. You can catch it when it starts to rise at 5:31 p.m. Tuesday in Boston (or, you can check your location here for when the moon rises and sets). The moon will rise in the northeast and set in the northwest. Weather shouldn’t be a problem. The National Weather Service is predicting that there will be mostly clear skies tonight and some clouds Wednesday, so the super snow moon will be visible in the sky until it sets at 7:25 a.m. Wednesday.